"Kim Clark" redirects here. For the 2006 Michigan candidate for U.S. Congress, see Kim Clark (candidate). 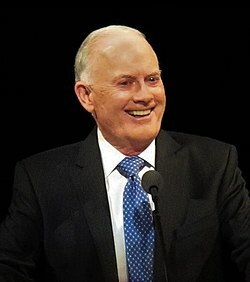 Kim Bryce Clark (born March 20, 1949) is an American scholar, educator, and religious leader who has been a general authority of The Church of Jesus Christ of Latter-day Saints (LDS Church) since April 2015, and the church's seventeenth Commissioner of Church Education since August 2015. He served previously as the 15th president of Brigham Young University–Idaho from 2005 to 2015, and as the dean of the Harvard Business School (HBS) from 1995 to 2005, where he was also the George F. Baker Professor of Business Administration. Kim B. Clark was born on March 20, 1949, in Salt Lake City, Utah. He and his family lived in Salt Lake City until 1960, when his father's new job required them to move to Spokane, Washington. Clark matriculated at Harvard University in 1967 as a pre-med major and left after his freshman year to serve as a missionary for the LDS Church in Germany. Following his mission, Clark enrolled for a time at Brigham Young University. In 1971, he resumed his studies at Harvard, where he received B.A. (1974), MA (1977), and Ph.D. (1978) degrees in economics. Clark joined the Harvard faculty in 1978 and served as Dean of the HBS from 1995 to 2005. As a professor at the HBS, Clark's research focused on modularity in design and the integration of technology and competition in industry evolution, particularly within the computer industry. He has published several articles in the Harvard Business Review and peer-reviewed academic journals. A few of his papers were co-authored with former HBS associate dean and former BYU-Hawaii president Steven C. Wheelwright. In 2005, Clark left the HBS when LDS Church president Gordon B. Hinckley appointed him president of BYU–Idaho. On January 27, 2015, it was announced that effective April 13, 2015, Clark would be succeeded by Clark Gilbert as the president of BYU–Idaho. Clark has served in various assignments in the LDS Church, including bishop, scoutmaster, elders quorum president, Sunday School teacher, and counselor in a stake mission presidency. From 2007 to 2014, Clark served as an area seventy in the church's Idaho Area. On April 4, 2015, Clark was sustained as a member of the First Quorum of the Seventy. On August 1, 2015, he succeeded Paul V. Johnson as the Commissioner of Church Education. Clark and his wife, Sue, have seven children. ^ "Five new General Authorities sustained during LDS Church's general conference". Church News. 4 April 2015. Retrieved 16 December 2018. ^ a b Prescott, Marianne Holman (August 5, 2015). "Seminary and Institute histories to be released". Church News. .
^ "Clark Gilbert announced as new president of BYU-I", KSL January 27, 2015. ^ "New General Authorities, Young Men Presidency and Primary Presidency Changes Announced". Newsroom. Retrieved 4 April 2015. The individuals listed below are current General Authority Seventies. Each is a member of either the First or Second Quorums of the Seventy. Those in italics are the current members of the Presidency of the Seventy. This page was last edited on 27 March 2019, at 23:42 (UTC).